September 2004 - About a year ago, my wife and I were bitten by the Victorian decorating bug. We started buying all sorts of Victoriana for our home. One of our favourite highlights is our Victorian dining room, it's also the "afternoon tea room". We have entertained many friends, clients and associates serving freshly baked scones with clotted cream, assorted jams and of course plenty of good tea and conversation. As a result, we've come to love touring antique shops for items deemed Victorian enough to add to our home. Recently on one of our "antiquing" excursions, we came across a wonderful looking "external brass-horn gramophone". To our delight it actually worked! We knew nothing about gramophones. The antique dealer confessed she had never sold one before, it had only been in her shop for about 10 days and declared $350 a "fair" price. My wife cooed about how nice it would be to play her mother's beloved old 78s on a vintage gramophone, so we bought it on the spot. Once home, I did a "Google search" for "gramophones", wanting to learn everything I could about the new addition to our Victorian parlor. One of the first things I learned is that old gramophones use lots of needles. In fact, you replace the needle after each play to preserve your vintage 78 rpm records. I also learned that an authentic gramophone retails for a minimum of $1000. Boy! was I surprised to read that - what a great deal I had found! My excitement continued to grow and I became even more enthusiastic. I read everything online about gramophone and antique phonographs. I surfed websites through the UK, US and Canada. I learned all about Victor talking machines and the various models. I discovered cylinder records, disk records, Pathe records and Edison Diamond Discs. I learned the difference between an external horn gramophone and an internal horn Victrola. I found numerous clubs, groups, and associations, including the Canadian Antique Phonograph Society. I learned that there were all kinds of collectors of gramophones, needle tins, cylinder covers, 78 rpms - it was all so fascinating. Beware of "crap-o-phones" - these are reproduction phonographs and gramophones being sold as real antiques! Before you buy, educate yourself about these fake reproductions so you don't get fooled into buying junk! Crap-o-phones are pieced-together phonographs made in India and Pakistan for pennies. They are made out of old abused, cheap portable phonograph parts and pieced together to make them look like authentic horned phonographs. I began looking very closely at my machine. It looked old. The turn-table was certainly old, the green felt was tattered and well-worn. It had to be real. The tone arm and sound box looked old, too. I continued with my research, learning other ways to tell if my gramophone was a fake. Being a novice with barely 24 hours of "gramophone experience" I looked at hundreds of images of authentic and fake gramophones. Mine didn't look like any of them, but it did have some questionable characteristics, such as a "water decal" labeled "The Pello". My horn bracket looked old and not like the crude reproductions I had seen on images of fake machines. The crank handle came out horizontally, not on an angle. The tone arm looked authentic and old, as did my turn-table. The hardware on the machine was steel, not tin. I was convinced mine was an authentic gramophone. My enthusiasm soared to new heights! On the Canadian Antique Phonograph Society (CAPS) web site, I discovered "The Gramophone Doctor", a.k.a Bob Nix, newly appointed 2007 CAPS President. I immediately emailed "Dr. Bob" inquiring about minor repairs and getting some needles. Dr. Bob called me the next day asking me what I paid for my machine. When I told him $350, he immediately expressed some concern. I felt that sinking feeling again. He asked me if it looked crude and pieced together from various parts. I said, "I didn't think so." Bob then mentioned that he was coming to Toronto the following Sunday for a CAPS meeting and invited me to attend. He suggested I bring my machine and encouraged me to join CAPS. I was still convinced that my gramophone was authentic, so I gladly accepted his invitation and membership suggestion. With childlike impatience, I eagerly awaited Sunday. Meanwhile, I continued surfing the web and visiting various gramophone sites, printing them out and showing my wife my substantial research proving our gramophone was authentic. By Sunday morning I was 99.9% sure my machine was the "real McCoy". My wife came along for the ride. I could hardly wait to show off my find and tell members about my great deal. Remember the movie, "A Christmas Story" staring a young boy named, "Ralphie" who wanted a "Red-Rider BB gun" for Christmas but first had to convince his parents he "wouldn't shoot his eye out." Ralphie is assigned a school composition, "What I want for Christmas..." This was his big opportunity to write a masterpiece story that would surely convince his teacher and his parents why he deserved a "Red-Rider BB gun". After writing his story entitled, "What I want for Christmas is a "Red-Rider BB gun", and handing it in to his teacher, he day-dreamed about what his teacher would think. He imagined her disappointment with the other children's' stories as boring and average, but when she came upon his story, she would gush with excitement and joy at such a wonderful story deserving of an A plus, plus, plus! Well that's exactly how I felt on my way to this meeting. I imagined members congratulating me on such a wonderful find and what a great deal I had clinched, too! We arrived at the CAPS meeting, the room was already bustling with some 50 or more members. Dr. Bob greeted us. This was my crowning moment. But, when I saw the look on Bob's face my excitement "crashed and burned". Dr. Bob said, like a doctor telling a patient bad news, "there's no easy way to say it so I'll just say it, what you've got here is a genuine, bona-fide, CRAP-O-PHONE!" What did he say? My wife retorted, "crap-o-phone!" It was just like Ralphie's "let-down" experience when his teacher returned his assignment with only a "C plus" and a note saying, "You'll shoot your eye out". I couldn't believe it. Then Dr. Bob motioned other phonograph experts in the room to come over and look at my beloved machine. Soon there were three, four, five people all examining my crap-o-phone like interns at a teaching hospital, wearing white coats, doning clip-boards and stethoscopes, all the while diagnosing the symptoms of a terminal patient. I felt sick. Never mind the crap-o-phone I needed to see a doctor. I was suddenly feeling flushed and needed to sit down in a hurry. I even think one of the experts put a stethoscope to my heart, checking for a pulse! Several moments passed before I was able to re-gain my composure and felt strong enough to hear the prognosis of these esteemed experts. Turns out mine was a little better than most (small consolation). My beautiful brass horn was certainly impressive but it was far to heavy to be a real gramophone brass horn. 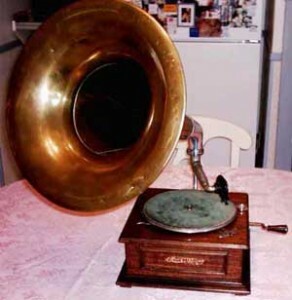 The turn-table was certainly old but it had been cannibalized from an old 1920ish portable phonograph. The tone-arm was an old Pathe part. The horn-bracket was nicer than most but still a reproduction. The water decal was also a fake. And the motor? It was cheap too. It didn't even have enough spring power to play a 78 record all the way through. I felt like I was in a 19th century laboratory witnessing the creation of a monstrosity pieced together from various body parts - it was a "Franken-phone!" Dr. Bob called the meeting to order, welcomed me as a new member and asked me if I would share a few words with the group about my experience. It was as though I was at an "AA" meeting, standing up and humbly confessing, "My name is Cameron and I bought a crap-o-phone." If this had been a cartoon I'm sure I would have morphed into a giant sucker right on the spot. Although my enthusiasm took a beating that day, I joined CAPS anyway, had enjoyable time and met a lot of friendly and knowledgeable people. I decided that someday I will own a real gramophone, but in the meantime, I have a great yarn of a story to tell over afternoon tea with friends and family, in our authentic Victorian dining room (or at least I think it's authentic). The moral of my story? "If it seems too good to be true, it probably is." If you're looking to buy an authentic gramophone for your parlor, do yourself a big favour and educate yourself first. There are reputable dealers connected to various antique phonograph associations who are more than pleased to point you in the right direction and save you from my humbling but informative learning experience. "Caveat Emptor -- Let the buyer must beware!"